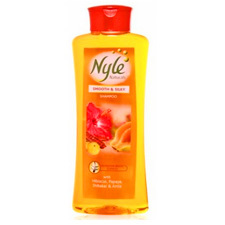 Buy Cavinkare Nyle Naturals Smooth and Silky Shampoo. Hair naturally, Silky smooth with a natural gloss. Every drop of Nyle Shampoo contains a unique Nutrition-boost complex, filled with the goodness of Hibiscus, Papaya, Shikakai and Amla. Nyle Naturals Smooth and Silky Shampoo conditions your hair naturally, making it silky smooth with a natural gloss.